Kami saying “I see your bum, Mommy” as I got out of the shower. Brooke throwing the wipes container in the toilet. Leah cheering on the Hawkeyes as they beat Penn State. Brooke saying the words “daun” (done), “bah-bah” (bye, bye) and “e-ah” (Leah). Leah reading books to Kami – she was so proud (me too)! I enjoyed dinner with some girlfriends last night. 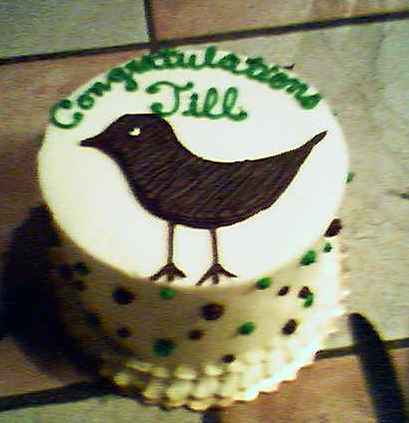 They surprised me with a cake celebrating Jillibean Soup’s success thus far. Thank you ladies – you made my week!!! How cute is this cake – and the bird…love it!!!! The cake was yummy too – it’s from Mrs. Goodman’s in Worthington. You guys are so thoughtful! Thanks Sarah for organizing the special celebration!!! On a more serious note, last week was a HUGE week in history. Our first African-American president was elected. Regardless of your political views, this is a huge step for the US and it’s people. The pastor of my former church passed along this list of 10 ways to pray for Obama…not because he’s an African American or because he’s a Democrat but rather because this election was monumental. We are in need of drastic change in this country and whether or not you feel he was the man to do it, he still needs our prayers. 2. Cover his wife and daughters in prayer. It is not easy to live under constant media scrutiny. Pray for Obama’s wife, Michelle, and their two daughters, Malia and Natasha, as they face invasive cameras, nosy reporters, maniacal fans and dangerous enemies. Obama is not only a politician but also a husband and a father. love that cake! congrats!….the 10 things list…..well said!! jen t.
Thanks for sharing the 10 list for our new president who needs all our prayers as have our presidents in the past. I welcome this new young man as our new president. I wish I could print off a copy to share with friends who do not have access to a computer.